The event itself began badly and got worse (Jonathan Hoffman’s analysis was published here). There was talk of how Israel ‘murders’ Palestinians. Mention of how protesting Palestinians are just performing a ‘Mitzvah’. Then the names were read out. All of them. Those that brought explosives to the fence, those that died in a firefight with Israeli soldiers. All the names. Including approximately 53 terrorists. Kaddish was said for them all. The truly sickening thought is this. Imagine the eight terrorists had not been killed by Israeli soldiers at the fence. What if they had killed the soldiers, broken through, reached a neighbouring town and massacred Jewish residents. What then? Then there would have been none of these Jews in Parliament Square. As the Jewish bodies had been buried, these Jews would not have publicly come to mourn and say Kaddish. Think about how twisted that is. 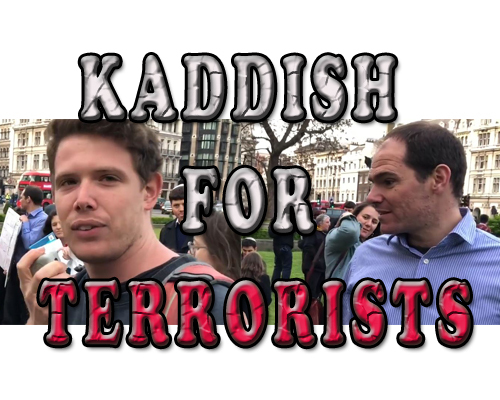 There is little difference between anti-Israel activists holding a vigil for terrorists at SOAS, and the people who said Kaddish at Parliament Square. The actions of those who were responsible for not raising a voice against, or cancelling this event are disgraceful. Some of these people are involved in summer camps that work with children. I wouldn’t want my children near anyone who is connected with this, nor the organisations that allow them to act as ‘influencers’. They wanted to make the community angry. I think it is safe to say they succeeded. “We will not be moving Canada’s embassy to Jerusalem,” said Canadian Prime Minister Justin Trudeau in response to President Trump’s decision to move the US embassy from Tel Aviv to Israel’s capital city. Palestinian diplomats welcomed the Trudeau government’s decision not to support the move. While condemning what he called Israel’s “excessive use of force” in defending itself against violent riots organized by the terrorist group Hamas, Trudeau seemed to take issue with the fact that alleged murderer Tarek Loubani — a Palestinian-Canadian previously arrested in Egypt for his support of Islamic terrorism — was reportedly shot in the leg during the protest. In stark contrast, Trudeau’s Conservative predecessor Stephen Harper lauded the decision to move the US embassy to Jerusalem. The Canadian Conservative Party has pledged to recognize Jerusalem as Israel’s capital if they win the general election in 2019. Shakir quickly assumed center stage. In a highly publicized May 2017 trip, he flew to Bahrain, ostensibly to push participants in a meeting of FIFA’s congress to take action against Israel. He also used Bahrain’s refusal to give him a visa to gain favorable press coverage for HRW’s campaign. On social media, he supported proposed US legislation to restrict military aid to Israel, repeating false NGO allegations on theme of systematic mistreatment of Palestinian children. In response to the government’s apparent ineptness on this issue, an organization known as Shurat HaDin (Israel Law Center) filed suit arguing that Shakir’s activities violated a recent amendment designed to block visas for BDS activists and groups. This triggered a formal review by the ministries involved, and Shakir was informed in November 2017 that his visa was being reviewed. Shortly afterwards, in a particularly cynical move even for HRW, Deputy Director for the Middle East Eric Goldstein suddenly appeared and posted selfies of himself and Israel/Palestine Advocacy Director Sari Bashi at the site of a protest in Jerusalem demanding action to free Avera Mengistu, an Israeli who had crossed into Gaza in 2014 and was being held, along with two others also with mental health issues. Goldstein and Bashi said nothing about the two Israeli soldiers, Oron Shaul and Hadar Goldin, killed in the 2014 war. Their bodies are still being held by Hamas, in blatant violation of all human rights norms. HRW’s token interest in the human rights of Mengistu did not save Shakir’s visa, and he was notified that it would not be renewed. But again, the bureaucratic and political process that has no understanding of the theatrics of human rights gave HRW control over the story. For the second time, and without interference, HRW was able to sell the image of Israel as suppressing legitimate NGO criticism to sympathetic media and diplomatic audiences. Shakir, with the support of the wider NGO network, became the symbol of human rights, victimized by dark right-wing antidemocratic forces. In this role, he was embraced by the EU Delegation in Tel Aviv, including a group selfie with Shakir that described HRW as a “globally renowned” human rights organization. Shakir and HRW then used the Israeli courts as a stage, claiming that “neither HRW – nor Shakir as its representative – advocate boycott, divestment or sanctions against companies that operate in the settlements, Israel or Israelis (sic).” The Israeli High Court rejected a stay on deportation pending legal review of the case, but Shakir got another round of media interviews and sympathetic coverage. The appeal, which can be expected to repeat the process, will be conducted without his physical presence. HRW will no create a virtual stage for Shakir, as well as sending talented proxies. In over a year of engagements and skirmishes across many stages, Shakir and HRW emerged with their images enhanced. The Israeli government, in contrast, bumbled through every act–first in the botched handling and then reversal of HRW’s initial visa application, and then by giving HRW the basis for stage managing the decision not to renew it. While government officials belatedly recognized that HRW and soft power warfare are serious threats, their one-dimensional strategies are still blind to the crucial theatrics. Israel does not need moral guidance from the “biased and obsessive” European Union, Public Security Minister Gilad Erdan said Tuesday in response to an EU statement of concern regarding Israel's treatment of two directors of human rights NGOs. “I advise the EU not to interfere in Israel's internal affairs,” Erdan said, saying that the EU's relentless campaign against Israel is “full of hypocrisy,” is an attempt to “blacken Israel’s name,” and is doomed to failure. Farah is the director of the Haifa-based Mossawa Center - the Advocacy Centre for Arab Citizens of Israel. Israel decided to not to renew the work visa of Shakir – a US citizen – two weeks ago because it said he supported boycotting Israel. After putting out a video highlighting the Palestinian demand for a “right of return,” the office of Senator Bernie Sanders declined to clarify on Friday whether he supports such a right, which, if implemented, would spell the end of Israel as a Jewish state. “Senator Sanders believes that the Israeli-Palestinian conflict needs to be resolved by the parties in accordance with international law and past UN resolutions,” a senior adviser to Sanders told The Times of Israel. On Tuesday, Sanders released a video montage on Twitter, embossed with his campaign logo, that cross-cut between the inauguration ceremony of the Jerusalem embassy this week and the violence that unfolded in the Gaza Strip. It also included segments from a panel discussion the Brooklyn native participated in with Lara Friedman, who heads the left-wing Foundation for Middle East Peace, Joe Cirincione, president of Ploughshares Fund, and Rob Malley, a former Obama administration official. The US Ambassador to Israel said evangelical Christians are more passionate supporters of Israel than many Jews. Friedman acknowledged that he personally invited John Hagee, who gave the closing benediction at the event, and pastor Robert Jeffress, who gave the opening address. As President Donald Trump nears the May 12 deadline to decide if America remains part of the Iran nuclear deal, there is something he should consider. Back in 2015, Argentina’s national-socialist (Peronist) Argentine President Kirchner, confessed to the world – by way of a speech before the United Nations General Assembly – that her government sold uranium to Iran for nuclear enrichment. While Livingstone remained one of Britain’s most high-profile politicians, his years in parliament saw a largely successful effort by the Labour leadership to keep him away from any real power. That changed, however, when Livingstone became London’s mayor in 2000 and won re-election in 2004. Age did not appear to bring wisdom. Instead, Livingstone’s second time in charge of London’s government proved as contentious as his first. In 2004, he invited the militant Islamic cleric, Yusuf al-Qaradawi, to City Hall, publicly embracing a man who – besides condoning wife-beating and the murder of homosexuals – had justified suicide bombings in Israel. Amidst a storm of criticism, Livingstone was utterly unrepentant. Instead, he apologized to al-Qaradawi for “the outburst of xenophobia in sections of the media” and invited him to visit London again. The following year, Livingstone was similarly unapologetic after likening Oliver Finegold, a Jewish newspaper reporter, to a concentration camp guard. Despite appeals from the chief rabbi and prime minister to apologize to the journalist, the mayor stubbornly refused to do so. David and Simon Reuben were, in fact, born in India and hail from an Iraqi-Jewish family, but none of this seemed to bother Livingstone who again refused to say he was sorry. The Jewish community leadership in the UK has reacted cooly to the resignation of former London mayor Ken Livingstone from the Labour Party, insisting that his departure does not absolve the party of its urgent need to root out anti-Semitism from its midst. Livingstone, who has a long history of hostile sentiment to the State of Israel, resigned on Monday from the Labour Party because of the accelerating disciplinary process against him for comments he made in 2016 arguing that Hitler supported Zionism and that the Zionist movement collaborated with the Nazis. The comments were roundly condemned by the Jewish community and others as a distortion of the historical reality, and Livingstone was suspended from the party pending disciplinary procedures. Speaking to The Jerusalem Post on Tuesday, President of the Board of Deputies of British Jews Jonathan Arkush said that there was no place for Livingstone in Labour any longer, but that his sentiments were also held by numerous senior officials in the party. Arkush also expressed surprise that Labour party leader Jeremy Corbyn said that Livingstone’s resignation was “sad after such a long and vital contribution to London and progressive politics” but that it had been “the right thing to do.” Arkush insisted that Corbyn should have said that Livingstone had no place in the party, was glad to see him go, and should have also rejected his offer to continue campaigning for Corbyn and Labour. Arkush added that Corbyn had not done enough himself to have Livingstone removed from the Labour party, noting that the former mayor had been suspended two years ago and that he only resigned because Labour’s National Executive Committee had been scheduled to create a timetable for the disciplinary procedures against Livingstone. Ken Livingstone has declared his intention to resign his membership of the Labour Party, saying that the ongoing processes of disciplining him after he stated that Hitler “was supporting Zionism” was a “distraction”. In response, Jeremy Corbyn expressed sympathy, stating that he was “sad”. For two long years, Mr Corbyn has hidden behind the fig-leaf of ‘due process’ after Mr Livingstone continued to peddle a particular perversion of history that attempts to make Jews complicit in their own genocide, and demonises “Zionists” as an alien group which collaborates with Nazi, and whose policies persecute Jews. That this fiction, debunked by the world’s historians, could be broadcast by a senior Labour figure without it being sanctioned by his immediate explusion will shame the Labour Party forever. Mr Corbyn did not act decisively in those years, and by expressing sadness now, he has rubbed salt in an already deep wound. Mr Corbyn also continued to attempt to elevate Ken Livingstone’s defender, Martha Osamor, to the House of Lords. The Labour Party has now missed its opportunity to show that it is serious about racism by expelling Mr Livingstone, and this episode now frees it from the burden of having to even try. In addition, by removing himself from the fray, the legions of Labour and Jeremy Corbyn supporters who openly back Mr Livingstone’s distortion of history will now be emboldened to continue to do so, knowing that the Party itself has failed to land a blow. Jeremy Corbyn has decided to nominate Martha Osamor to become a life peer, despite her vociferous defence of Labour figures suspended or expelled over antisemitism allegations, including Ken Livingstone, Jackie Walker and Tony Greenstein. In one letter unearthed by political blog Guido Fawkes, Ms Osamor, 75, said that Naz Shah’s demand that Israelis be transported to the United States was “not so outrageous within the historical context and involvement of Zionists with Nazis”, despite Ms Shah herself admitting that the statement was antisemitic. Ms Osamor has also said that Ken Livingstone was “largely accurate” to say that Hitler “was supporting Zionism”, and she slammed the suspension of Jackie Walker, who claimed that Jews were the “chief financiers of the sugar and slave trade”, as having been “applied and publicised in haste, without due consideration”. She added that suspensions over alleged antisemitism “undermine serious discussion and thinking” and “are also being made to silence criticisms of Israel, hamper the work of Momentum activists, and undermine Labour leader Jeremy Corbyn”. She also shared a letter in which it was claimed that allegations of antisemitism were being “weaponised”, which Mr Corbyn has been forced to denounce, though through his ennoblement of Ms Osamor it is hard to imagine that he meant it. Gideon Falter, Chairman of Campaign Against Antisemitism, said: “Jeremy Corbyn has shown a particular taste in nominations to the House of Lords. First came Shami Chakrabarti who whitewashed Labour’s antisemitism crisis with her dismal report, and now he is sending Martha Osamor to join her. Ms Osamor is one of the foremost defenders of disgraced Labour figures suspended or expelled over antisemitism allegations, including Ken Livingstone, Jackie Walker and Tony Greenstein. She has compared the suspension of Labour members over alleged antisemitism to the McCarthy era and the Salem witch trials. Brazilian musician Gilberto Gil on Tuesday canceled his planned July concert in Israel, in a decision welcomed by boycott activists. Gil, who served as Brazil’s culture minister between 2003 and 2008, was scheduled to perform in Ra’anana on July 4. Gil said he canceled July’s concert after “careful consideration with his band members,” telling promoters in an email that “we are all concerned about the sensitive times that Israel is currently undergoing,” the Haaretz newspaper reported. Supporters of the BDS (Boycott, Divestment, and Sanctions) movement linked his decision to violence at the Gaza border earlier this month. A Portuguese theater director has canceled his attendance at a major cultural festival opening in Jerusalem this week over Israel’s treatment of the Palestinians. Rodrigues had been set to stage his work “By Heart” twice during the festival, which runs from May 24 until June 9. In a Facebook post on Thursday, he said he was joining a global cultural boycott of Israel that has seen some artists and musicians refuse to perform in Israel. Rodrigues wrote: “Although I am strongly against the oppression of the Palestinian people by the Israeli government…I accepted [an invitation to perform] because I believe that the people of a country and its political administration are not the same thing,” he said. Nothing beats a good party on a Saturday night in a dusky bar in Bushwick, Brooklyn, unless, of course, you are Jew with a Palestinian flag on your back. Then you really know how to party. The aberration and perversion of Adalah-NY’s last event know no bounds. DJs4BDS, as they named their crazed event, had its inaugural edition last Saturday in NYC. But among the roughly 80 self-hating Jews, there was one person who only pretended to be one of them. This is how we know what went down. But let’s just set the dancefloor for a second. Adalah-NY, the centre of the Campaign for the BDS in NYC, is a fringe organization who claims to be strictly non-profit, and yet we know from NGO-Monitor that it is not financially transparent and gets support from a mysterious organization called Wespac. This Wespac sponsors Israeli Apartheid Week throughout the US campuses and injects money into the operation of Jewish Voice for Peace. Wespac is led by Nada Khader, a Palestinian woman who grew up in the U.S, served as a consultant for the UN Development Program in the Gaza Strip and is known as an avid voice against Israel. You see? After all, you can be a freaking rich Palestinian refugee who backs up hate speech, violence and antisemitism. Thank you, UNRWA, you are doing a great service! The Bank for Social Economy – a German financial institution that holds the most number of BDS accounts in the country – is permitting a boycott-Israel group to raise funds to boot Israel from sponsoring an August pop culture festival as well as urge the federal government to expel Israel’s ambassador from Berlin because of the Gaza conflict. The extremist German-based BDS group Jewish Voice for a Just Peace in the Middle East wrote on its website on May 9 expressing “solidarity with the Palestinian call to renew a boycott of the Pop Culture Festival until the support of the Israeli Embassy is dropped.” On Friday, Jewish Voice called on Germany’s government to expel Israel’s Ambassador to Berlin Jeremy Issacharoff and stop weapons deliveries to the Jewish state. BDS is an abbreviation for the boycott, divestment and sanctions campaign targeting Israel. Humanities students at Chile’s largest public university voted on Monday to support an academic boycott of Israel, an anti-Zionist group at the school announced. More than 80 percent of voters in the Department of Philosophy and Humanities at Universidad de Chile called for the severance of ties with Tel Aviv University and the Hebrew University of Jerusalem, activists supportive of the boycott, divestment, and sanctions (BDS) campaign said. The BDS campaign seeks to isolate Israel until it recognizes number of Palestinians demands, including the “right of return” of Palestinian refugees and their five million descendants into Israel. The vote coincided with riots held on Monday as part of the Hamas-led “Great March of Return,” during which 40,000 Palestinians, some of whom were armed, approached and tried to breach the Gaza border. Sixty-two Palestinians were killed and more than 2,500 injured in ensuing clashes, according to the Hamas-run Gaza Health Ministry. Student leaders at the University of California, Santa Barbara failed to vote on a divestment resolution targeting Israel on Wednesday, after a disagreement led half to walk out of a senate meeting. The measure — which called on the school to withdraw investments from companies “that provide military support to the occupation of Palestinian territories” — was debated during a ten-hour long hearing, with nearly 90 speakers sharing their positions during a public forum, the student-run Daily Nexus reported. Another speaker — identified as Yousef Ahmed — spent his allotted speaking time reciting the names of Palestinians who were killed in recent riots on the Israel-Gaza Strip border. The terrorist group Hamas has since acknowledged that the 50 of 62 fatalities reported earlier this week were its own members, while Palestinian Islamic Jihad claimed three others. The senators came to a deadlock after the student government’s attorney general said that the resolution would be regarded as “positional” and not “directional” legislation. Israel’s ambassador to the Netherlands on Tuesday filed a formal letter of protest against a “disgraceful” anti-Israel TV sketch that spoofed Israel’s winning Eurovision song, accusing the show of peddling anti-Semitic cliches about Jews and money. The parody also featured anti-Israel elements, with films showing Israeli soldiers shooting rifles and injured Palestinians while the performer sang: “We’re giving a party, are you coming? Soon at the Al-Aqsa Mosque, it’s standing there empty anyway.” The Jerusalem mosque is the third holiest Muslim place of worship, standing on the Temple Mount — the holiest site for Jews. Songstress Donna McCaul — who once represented Ireland in the annual Eurovision contest — has said she would be willing to perform on behalf of her country at next year’s event in Israel, despite call by a fellow Irish singer to boycott the Jewish state, The Irish Sun reported on Tuesday. Eurovision is held annually in the home country of the previous year’s winner and this year Israel’s Netta Barzilai took home the top prize. "Maus" cartoonist Art Spiegelman is this year's winner of the Edward MacDowell Medal for lifetime achievement. The honor was announced on Sunday by the venerable MacDowell artist colony, based in Peterborough, New Hampshire. MacDowell chairman Michael Chabon said in a statement that Spiegelman, the first medal recipient honored for graphic novels, pioneered making comics respected as an art form. He said Speigelman's work was "personal and world historical." Spiegelman is best known for his Holocaust works "Maus: A Survivor's Tale: My Father Bleeds History" and "Maus II: A Survivor's Tale: And Here My Troubles Began." Chabon will present the medal to Spiegelman on Aug. 12 during a free public event in Peterborough. Previous MacDowell medal winners include Robert Frost, Toni Morrison and Joan Didion. Some 100 mobility scooters were donated last week to disabled Israel Defense Forces veterans by philanthropists Dr. Miriam and Sheldon Adelson.